Yu Darvish is just one of the many Dodger pitchers to make a brief trip to the disabled list. In a season when the Los Angeles Dodgers are dominating everything in sight, they also lead the majors in a less praiseworthy category: trips to the disabled list. Two weeks ago, prized trade-deadline acquisition Yu Darvish was sent to the 10-day DL; last week, dark-horse Cy Young candidate Alex Wood was. Those are just some of the latest moves in what has become essentially a weekly ritual for the Dodgers, marking their 37th use of the short-term DL so far this season (25 of which have been for pitchers), more than any other team in baseball. Critics charge the Dodgers with exaggerating these kinds of injuries to game the DL, allowing the team to rest some of its starting pitchers without giving up a roster spot. And the Dodgers are certainly leading the way in this practice, which became much easier to pull off after a rule change this season shortened the length of a short-term DL stint from 15 days to 10. But the Dodgers aren’t the only outfit to make heavy use of the new disabled list — teams across the league are stashing more players on the short-term disabled list this season. Nor is this a completely new development: Even before the rule change, short-term DL use had been on the rise for years. In an age of one-inning relievers, roster size is a major limitation for modern front offices. Any unusable players — for example, a starting pitcher who threw yesterday — can cost a team, as their spot could be taken by yet another flamethrowing bullpen arm. So teams have come up with all sorts of ways to overcome roster-size limitations, ranging from sending an endless churn of relievers back and forth between triple-A and the majors to creating potential dual-role position player-pitcher hybrids. But the 10-day disabled list might have opened up new possibilities for roster manipulation. A starting pitcher who is placed on the list may only have to miss a single start while freeing up his roster spot for a fresh arm out of the bullpen. The tactical advantage of that additional reliever, combined with the extra rest it gives the starter, appears to have been too good of an opportunity to pass up. Smart teams like the Dodgers have exploited this latest edge. Here’s a chart showing MLB teams’ use of the short-term disabled list by season since 20091 (for comparison’s sake, I included uses for the short-term DL’s longer, 60-day brother). There’s still more than a month left on the schedule, but we’re on pace to see the 10-day DL used 775 times this season. That would be an increase in short-term DL stints of 40 percent compared with last year. 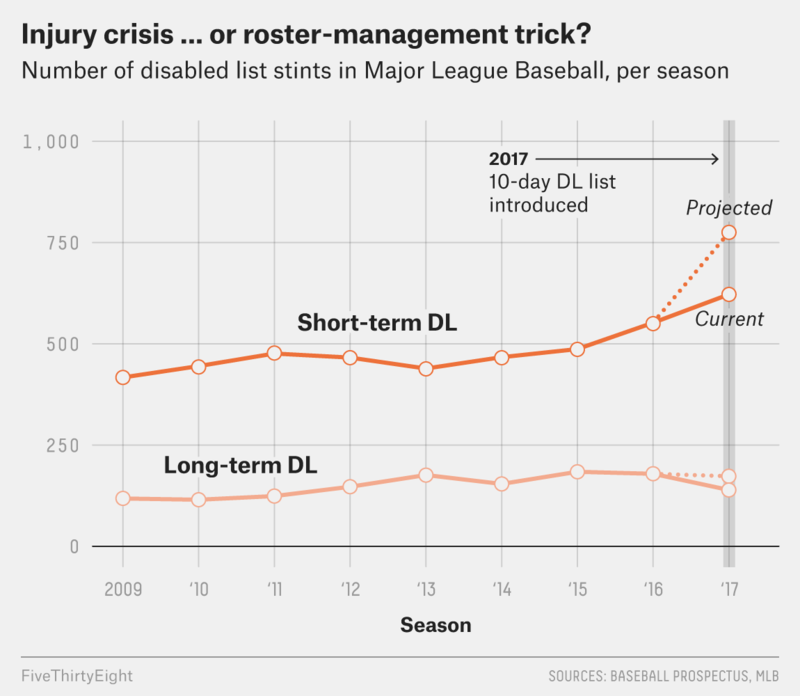 And it’s not just that injury rates are suddenly up across the board in 2017: Long-term disabled list usage has stayed at almost the same level for the past five years. It’s clear, then, that the new 10-day disabled list has changed the way teams tinker with their rosters. But the new list didn’t so much create a new problem as exacerbate an old one. League-wide use of the short-term DL has jumped in each of the past four years (including this season) — and the Dodgers have paved the way. Since Andrew Friedman left the Tampa Bay Rays to become president of baseball operations for the Dodgers after the 2014 season, the team has led the league in short-term DL stints every year (only once during those three seasons did the Dodgers have the most long-term DL stays — a clearer sign of legitimate injury problems). The increasing use of short-term DL stints across baseball has prompted questions from the league about whether all these ailments are legitimate. Last month, Rob Manfred, MLB’s commissioner, expressed fears that the list was being manipulated — and with good reason. In an interview last year, Dodgers starter Ross Stripling suggested that one of his trips to the disabled list in the past was less about recovering from an injury and more about hitting an innings limit. Much of the increase in short-term DL trips from recent years seem to be for nonspecific reasons, ranging from weariness to different kinds of strains. In 2016, five short-term injuries included “fatigue” in their description; over the three previous seasons, there were only three such trips, combined. Similar increases have occurred in short-term DL trips for other vague injuries. Increases in injuries described with the words “fatigue,” “tightness” or “strain” have together accounted for almost 50 percent of the total jump in short-term disabled list trips since 2014. Unless baseball became a lot more tiring and stressful in the past three years, it seems as though teams may be exaggerating small issues in an effort to free up roster spots. But while the Dodgers seem to have pioneered this tactic, whether they are deriving any substantial advantage from it is unclear. That’s because the exact benefits of having a fresh relief pitcher are difficult to calculate. By at least one measure, though, the Dodgers are succeeding. In a normal five-man rotation, pitchers rest for four days and throw on the fifth. But by stashing a starter on the DL, a team can give him a much longer recovery period. Extended rest (five or more days) seems to reduce the probability of a serious injury by 20 percent, so a smart team might try to frequently rest fragile starters to minimize the risk that they will become severely hurt. And that’s exactly what the Dodgers have done. So far this season, they are on pace to have the second-most starts thrown by pitchers with five or more days of rest than any team since at least 2009. And last season’s Dodgers already had the third-highest mark since 2009, so the new 10-day disabled list didn’t necessarily inspire this tactic. But it might have made the strategy more effective by allowing their pitchers to miss fewer starts. Even knowing that rest prevents injuries, whether Los Angeles prevented more serious ailments by using the short-term DL so frequently is difficult to say. Friedman built the Dodgers’ rotation on a surprisingly thrifty budget, relying largely on injury-prone pitchers who could be bought on the cheap. And the Dodgers seem to have gotten their money’s worth: They racked up more disabled list trips than any other team in the league in 2016, even if you focus only on the 60-day list (for which there is no tactical value to overuse). So even if you believe that the Dodgers are gaming the disabled list with fake injuries, they also seem to be suffering the most genuine ones of any team. But despite all that missed time, the Dodgers’ rotation has also been very successful, earning the second-most wins above replacement in baseball since 2014.2 As if harkening back to his career with the low-budget Rays, Friedman managed to put together one of the league’s best starting units using cheap talent and a clever strategic advantage. And with Los Angeles currently riding that rotation to an all-time great season, MLB’s 29 other teams might do well to copy the Dodgers’ roster-manipulation tactics. The earliest year for which Baseball Prospectus has detailed disabled list data. Using FanGraphs’ edition of WAR.